The Pecos pueblo lay midpoint in a passage through the southern end of the Sangre de Cristo Mountains, in northern New Mexico. 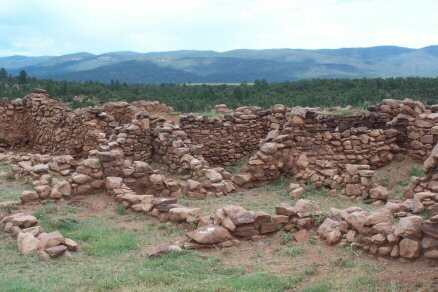 The pueblo and a Spanish mission, both now in ruins, share a small ridge. A thousand years ago this village sat astride the trade route between Pueblo farmers of the Rio Grande and buffalo hunting tribes of the plains. The Pecos indians were the middlemen, taking in buffalo hides, slaves, flint and shells from the mostly Apache nomads, to exchange for the textiles, turquoise, pottery and crops that the river Pueblos could offer. The Pecos indians became powerful and populous, housing over 2,000 inhabitants and able to field 500 fighting men. In the 1400s, just before the Spaniards arrived, they had created a multi-storied towns that overlooked the streams and fields that nourished their crops. The Pueblos of Pecos took advantage of their good situation by creating a rich cultural tradition with solid architecture and beautiful crafts. Regulation of social, family and individual life came from a religion that bound all things together and counseled balance, harmony, and fitness as the highest ideals. Now Ideals did not always prevail; war between Pueblo groups was fairly common. They were skilled farmers, taking advantage of the good soil for productive farming. The staple foods were the traditional corn, beans, and squash; the Pecos people built check dams to slow the runoff of rain, and had considerable success. In 1541 Coronado found the pueblo storerooms piled high with corn, perhaps as much as a three-year supply. But the Pecos Indians' dominance did not last forever. Spaniards in Mexico City, too late to partake of the fabled spoils of the Aztecs and Incas, headed north in hopes of finding their own riches. Francisco Vasquez de Coronado set off in 1540 with an army of 1,200 in search of his destiny. He found the village of Cibola, near present-day Gallup, and attacked the Zuni village of Hawikuh, grabbing its store of food for his hungry soldiers. He then came across Pecos, where the indians welcomed the Spaniards. A plains indian told tales of great wealth to the east, and Coronado eagerly marched off. The indian's plan to have them die of starvation on the gold-less plains nearly succeeded; but Coronado stumbled back into Mexico City in 1542, empty-handed. Some 60 years later, more Spaniards under Don Juan de Onate came to Pecos with conversion to Catholocism on their mind. Relations between the Spaniards and the Indians teetered from fair to poor for dozens of years, until finally in 1680 Indians banded together to drive the Spaniards back to Mexico City. Local rule didn't last long, as twelve years later Spaniards returned, sometimes in peace, sometimes with the sword, and retook dominion of the land. But the high point of Pecos culture was long in the past. By the 1780s, disease, Commanche raids, and migration reduced the population to less than 300. By the time the Santa Fe Trail trade began flowing past in 1821, Pecos was practically a ghost town, with the last native inhabitants moving in with relatives 80 miles to the east at Jemez pueblo. 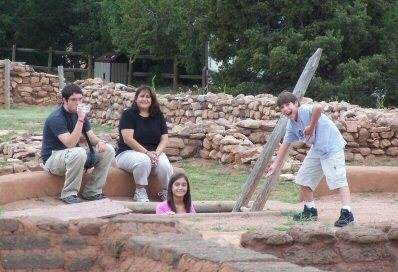 Today ruins of both the Pecos Indians structures, and the Spanish Mission built next door, are standing as a reminder of what once was here. Visitors can walk along a path with a free guidebook in hand and learn about where people lived here for the last 1,000 years. On the Spanish side, the mission church half-survives, giving visitors an idea of its original size; we understand that this is the smaller of two that were built here. Also partly reconstructed are many small rooms for the priests and the many helpers who took care of the day-to-day functions of the place, along with corrals for the various animals. 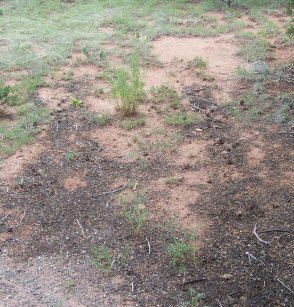 Remains of the Pecos' structures are more varied and numerous. There was a wall around their town that served as a city limits marker. 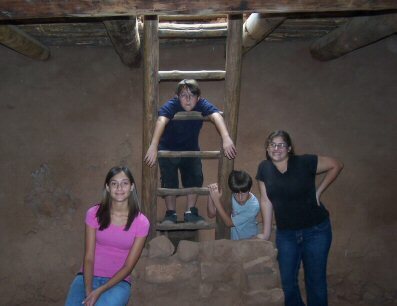 The pueblo was a multi-storied building, with people living on all floors. Rooms opening to the outside were living quarters, while those opening only into other rooms were for sleeping and storage. Many ground floor rooms were entered through the roof, and may have been used for trash disposal. There are also several reconstructed kivas that visitors may enter. 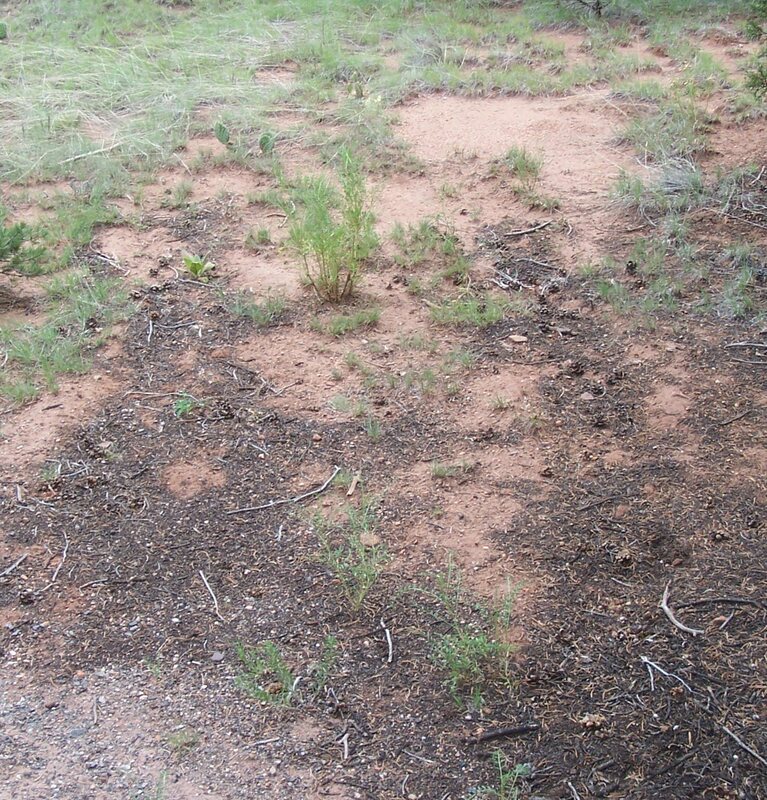 These were places where Pueblo people performed rituals to insure their well-being. It appears that kivas were also used as workrooms, where men wove the kitls and sashes worn by dancers. Reports from the 1400s indicate there were more than 600 rooms, four to five stories high. The fortress-like construction allowed the occupants to run atop and around the buildings, instead of needing streets. Part of the old Santa Fe Trail is visible under a wooden bridge. 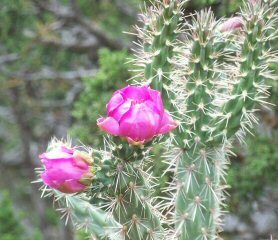 The weather was wonderful for our visit to Pecos NHP. 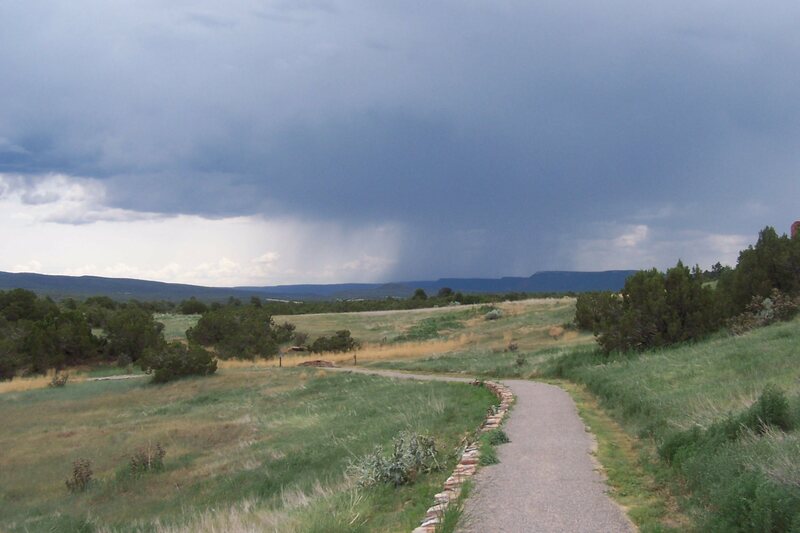 It was a cloudy day in New Mexico, and rain threatened but never delivered, so the temperature was perfect. Pecos wasn't very busy; I think there might have been four or five other groups wandering around with us, some in the visitor center, some on the path. The kids seemed to like this; we prefer self-guided tours, and the little brochure was clear and concise about what we were seeing. More importantly, it wasn't a long walk, merely several hundred yards, with plenty to see as we made our way around. The visitor center says the trail is 1.25 miles long, but it seemed shorter to me. We had fun here. It wasn't something I'd call fantastic, but certainly well worth the effort of seeing. 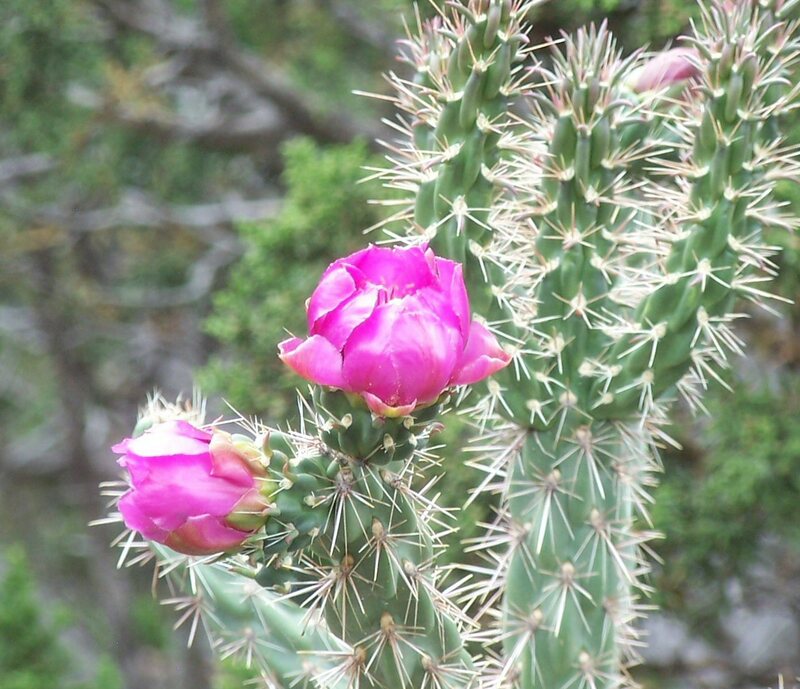 Pecos does offer guided tours, so call ahead and see what's available on the day you visit. There is a Junior Ranger program for the kids, and it's a great little Park for them to run around and explore. There is no camping in the park, but the town of Pecos is two miles away and has a couple of inns. Pets are allowed on the trail if leashed. And remember, Pecos is at 7,000 feet, so use caution if you're not used to the altitude. From Santa Fe, take I-25 east for about fifteen miles to exit 299 at Glorieta. Take Route 50 east for about eight miles to the town of Pecos, and then take Route 63 south for about two miles to the Pecos NHS turnoff. Fort Union National Monument is about 50 miles east northeast. 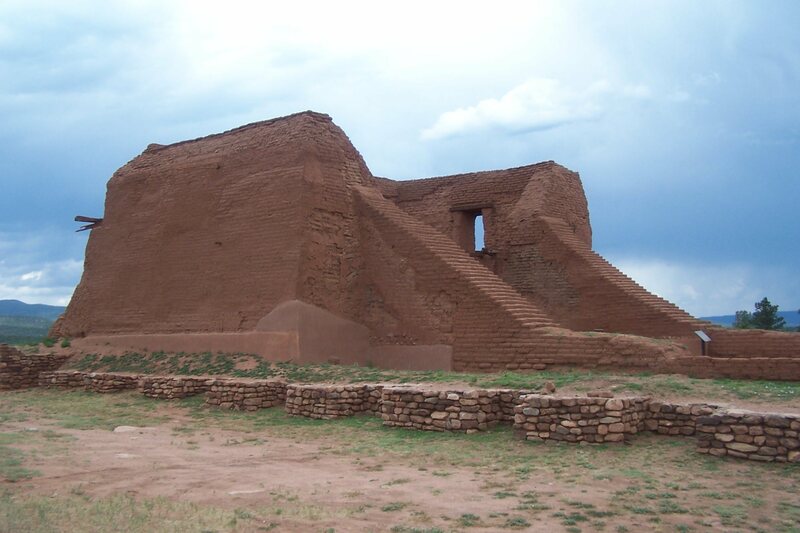 Salinas Pueblo Missions National Monument is about 90 miles to the south. Petroglyph National Monument is about 75 miles to the southwest. Bandelier National Monument is about 40 miles to the northwest.